I haven’t really watched the other movies in this franchise, but I was drawn in by the trailer of this one… and I’ve also enjoyed Chris Pratt’s work in previous films I’ve seen him in. It was good to see the way the theme park worked and there were some fairly sweet scenes with children having the opportunity to ride some of the smaller dinosaurs. I could, in many ways, understand the desire to keep people’s interest in a world where everything is overtaken by the next thing. I felt that lack of interest was demonstrated quite well in the way Zach kept using his phone… or making eyes at the pretty girls, instead of paying attention to the attraction. It was pretty cool to see the use of theme park-style rides, along with the almost museum-like quality of seeing the different types of dinosaurs. One of my favourite parts of the movie was probably the raptors. It was good to see Owen’s interactions with them and the fact that he respected them as animals, while still caring for them. I enjoyed seeing the brotherly relationship between Zach and Gray, especially towards the end of the movie. There were times I could empathise really well with the both of them… and it was pretty cool to see that they were resourceful, as well as the nods to the previous Jurassic Park movies. There were some quite jumpy moments in this movie and several scenes that were really creepy. 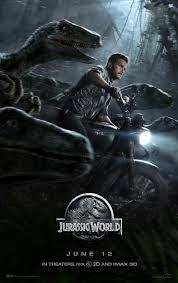 Although the gore level is quite low, there are still dinosaurs attacking people in this movie… and it’s fairly clear what’s happening. Although the romance worked reasonably well, I did think that the movie did fall into the trap of the ‘kiss at the wrong time’. I did think that a lot of the characters had good parts to play and most of them came across as integral to the story. I felt this movie was really entertaining and able to keep my attention focused throughout. I recognised quite a few of the actors in this and felt they played well off each other. This is probably a film I would watch again.